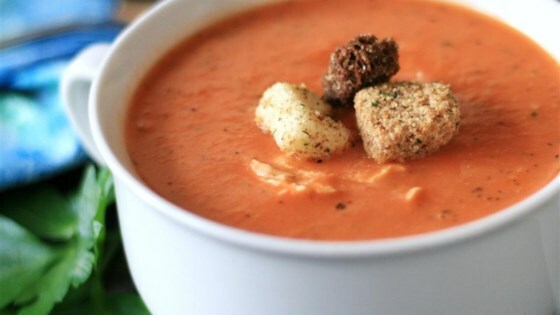 "Yummy and filling tomato bisque with tender pieces of chicken! Use a store-cooked chicken and a can of tomatoes, and this dinner will be ready before you know it! Definitely one of my 30-minute meals." Heat olive oil in a large pot over medium heat. Cook and stir onion and garlic in hot oil until onion is soft, about 5 minutes. Sprinkle flour evenly over the onion mixture; add tomatoes, chicken broth, oregano, basil, and parsley. Bring the liquid to a boil and cook until the tomatoes are softened, 8 to 10 minutes. Pour soup into a blender no more than half full. Cover and hold lid in place. Pulse blender a few times before leaving on to blend. Puree soup in batches until smooth and return to the pot. Stir chicken, heavy cream, sea salt, and pepper into the soup; simmer until the chicken is hot, about 5 minutes. Very easy to make; didn't take long at all, but overall, my dad and I didn't like it. I cooked this to the tee. It just didn't taste good. It looked delicious, but it wasn't for us. Easy, quick and most importantly very good. Didn't make any adjustments, made the soup just how it is directed and it was excellent! Easy and quick!! The bisque was great. Not so much the chicken in it. Excellent. Added a can of tomato soup and half and half for more quantity. Also a bit of taco seasoning for an extra zip.